Note from Maria (Land of Iron Cultural Heritage Officer) – Through the Land of Iron Landscape Partnership Scheme we’ve organised a number of historic building volunteer events ranging from lime mortar workshops to surveying. One of our volunteers was Dr Ian Wyre who has a PhD from Northumbria University as part of the Virtual Medieval Newcastle project. Ian attended almost every task and demonstrated high potential and a strong background. Because of this he was selected to attend a week’s training event with Historic England and subsequently undertook initial surveying alongside core staff ahead of conservation works. From then Ian has gone from strength to strength and gained a hard sought after position with an archaeological consultancy. So we at the Land of Iron could not be more proud – we wish him well on what will undoubtedly be a successful career ahead. Since living in the north east I had always been on the doorstep of the North York Moors, however it was a place you would visit only for day trips and holidays. A Facebook post calling for heritage volunteers for help with This Exploited Land of Iron project has given me a new, lasting connection with the National Park and its unique heritage. At the time I had found myself long-term un-employed and, as many people find out, this can become isolating and significantly affect your overall wellbeing. I grew up with language and other neurological difficulties which had also come to the fore at this point in my life. At this time, re-starting any sort of career seemed out of reach; there was a lot I thought couldn’t do and any change seemed overwhelming. The Facebook post however, came across as something I could do. It was an invitation to be involved with historic building conservation of the industrial monuments found throughout the ‘Land of Iron’ area, the North York Moors. Through the support of the project, guided by its Cultural Heritage Officer, Maria, my volunteering offered a varied sets of tasks encompassing a wide scope of heritage skills, arranged around the National Lottery funded Landscape Partnership Scheme project. It was all built on a practical, hands-on and welcoming basis (something necessary for me at that point! 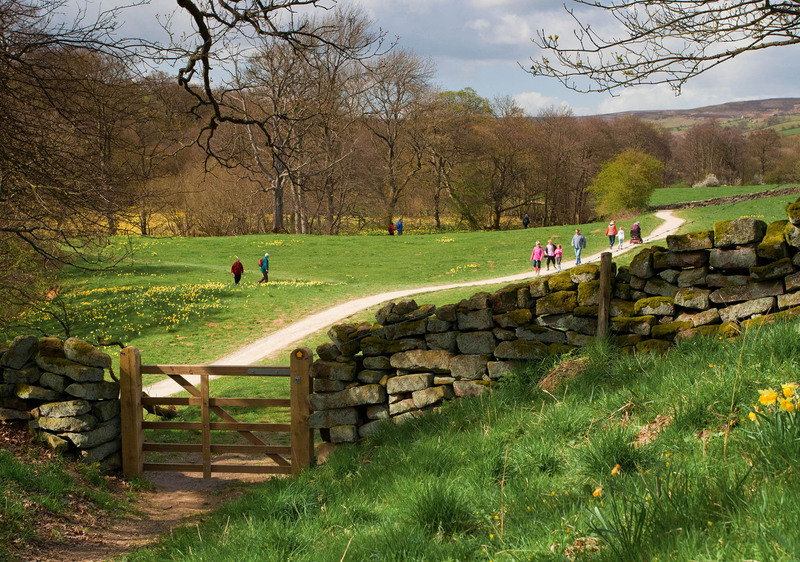 ), open to all ages and abilities, set in the stunning National Park. Joining the project, within months I had learnt to repair with lime mortar through to high tech laser-scanning of historic structures. A highlight for me that summer was the archaeological dig at Goathland Incline. Within the trench I worked in were foundations continuing below almost a metre and a half depth from the surface. 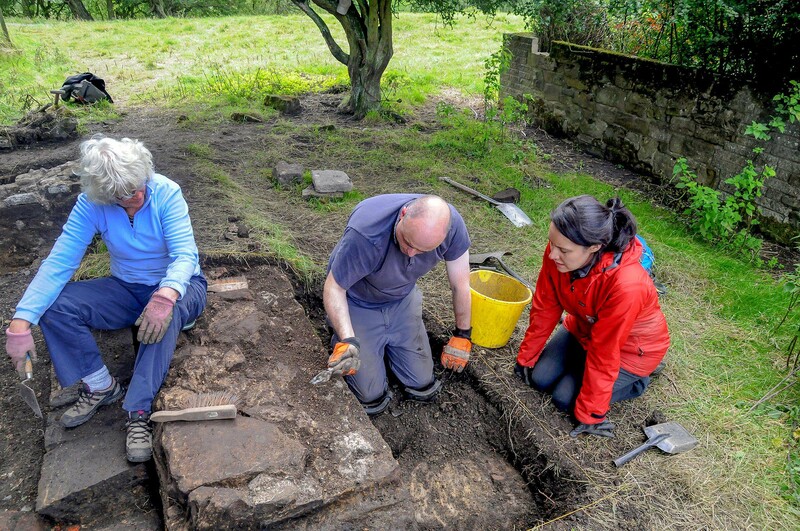 The team of enthusiastic and hardworking volunteers and staff had found the substantial remains of stone walls for the engine house, as well the wagon turntable, with which to piece together the previously little known history of the site. The dig took place with visits from many a walker along the old track bed and the sound of steam trains from the nearby North York Moors Railway, aspects which all added to the experience. Another highlight has been contributing to the Historic Building Recording with Kim, the project’s Cultural Heritage Assistant. 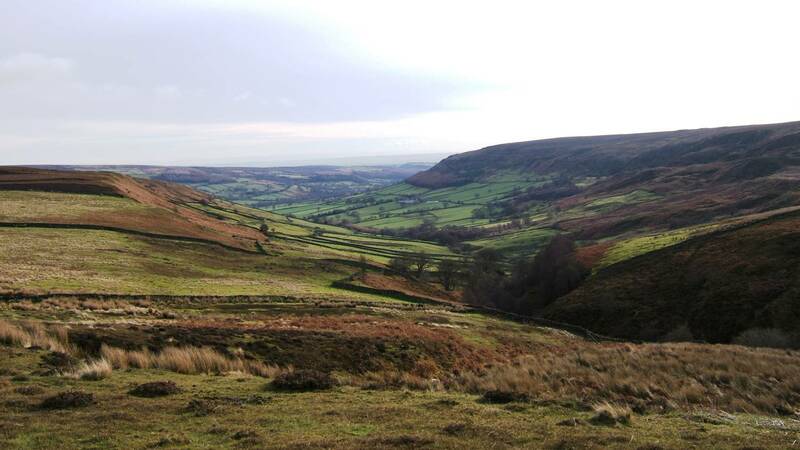 Some of this included survey of the enormous ruins for the iron kilns lining the sides of the stunning Rosedale valley. These contrast to the human scale of the workers cottages which help to tell an almost disappeared social story of the area. For me, primarily, the project has added to the tapestry of the stunning North York Moors landscape. The remnants of the immense and historic ironstone industry scattered amongst the peaceful, green and idyllic landscape feeds the imagination. Seemingly not so long ago, the sky was orange and black from the ever-burning furnaces which roared above the clatter and squeal of railway trucks. The conservation the project has achieved of the archaeological remains will keep this rich industrial history for generations to discover for years to come. For me, the project also enabled a step to finding work with an archaeology company. I have been a historic buildings project officer for a year now. Even when the work was difficult the hands-on skills the project brought me form the day-to-day basis of my role. This Exploited Land of Iron truly forged links for me and others with the North York Moors National Park and its important heritage. If you want to get involved with the Land of Iron or might be interested in any other volunteer opportunities please contact our Volunteer Service. Has the snow ever stopped you from doing your job or getting in to work? It didn’t stop the workers on the Rosedale Railway! 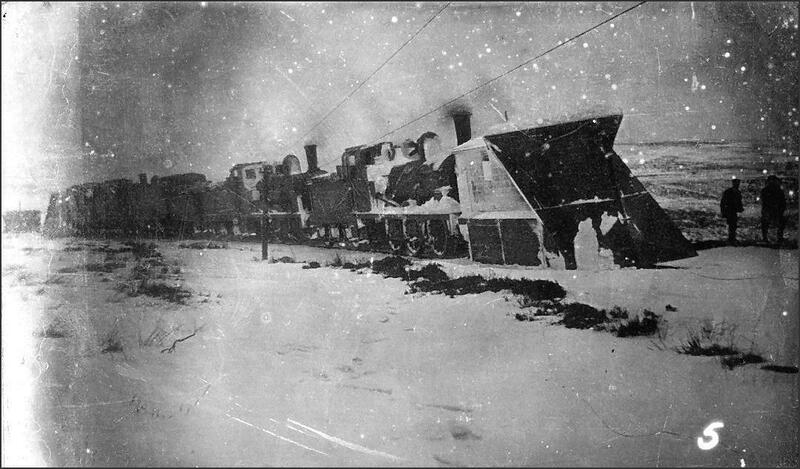 The locomotives used were fitted with snow ploughs to clear the tracks. Time is money. The railway was built to transport iron ore from the Rosedale mines, across the moors, connecting to the main line north and on to be processed at ironworks in Teesside and County Durham. 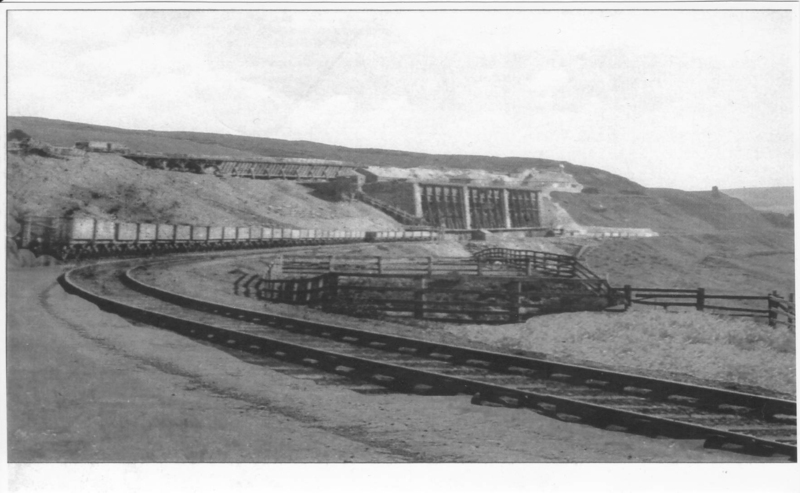 The railway was opened in 1861 and use to run from Bank Top Kilns on the west side of Rosedale over the top to Battersby Junction, where it connected into the main railway line. A later addition connecting the Rosedale East Kilns into the Rosedale line via Blakey Junction was completed in 1865. Have a look at what the winter conditions were like for the workers on the Rosedale Railway in its time. 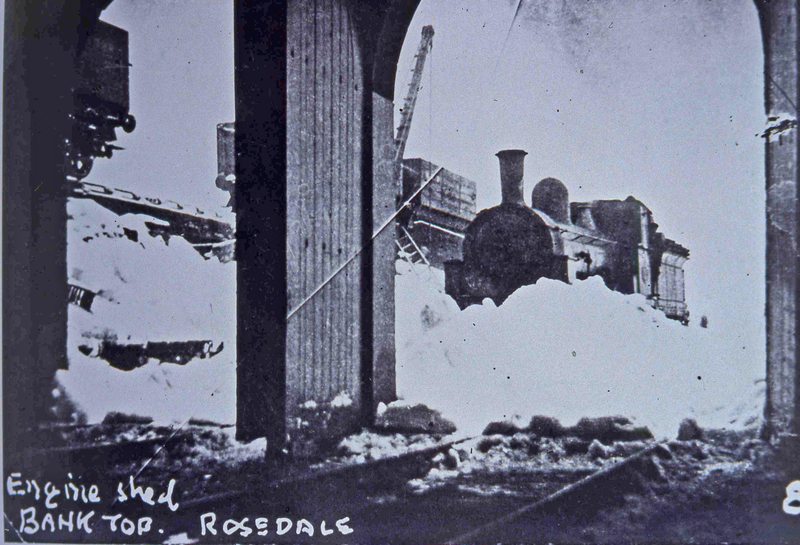 Engines and snow ploughs in Rosedale (courtesy of Rosedale History Society). Rosedale Bank Top: Extensive engineering maintenance was done on site because of the difficulty of getting locomotives down off the moors – the extreme gradient change at the top of Ingleby Incline meant that 6 wheel locomotives couldn’t be taken down the incline without the centre wheels being removed. 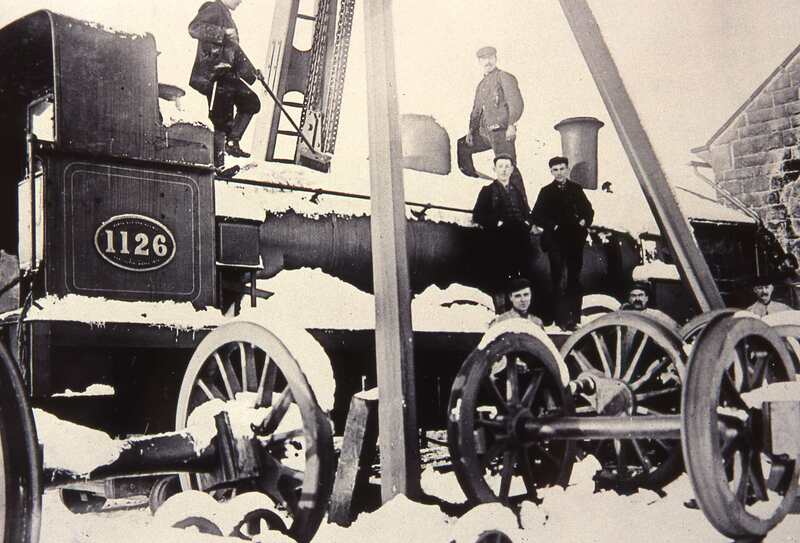 Sheer legs and lifting chains were used for removing or replacing locomotive wheel sets which periodically had to be machined to restore their circumferential precision. Spare sets were brought up, and the damaged ones sent to Darlington machining shops. Off the moors locomotives would go for maintenance to the Darlington engineering sheds. (Courtesy of Malcolm Bisby). Clearing the snow under the bridge near Blakey Junction (courtesy of Malcolm Bisby). The Blakey Ridge road today runs right next to where that bridge was – you might still see its remaining parapet wall next time you go that way. 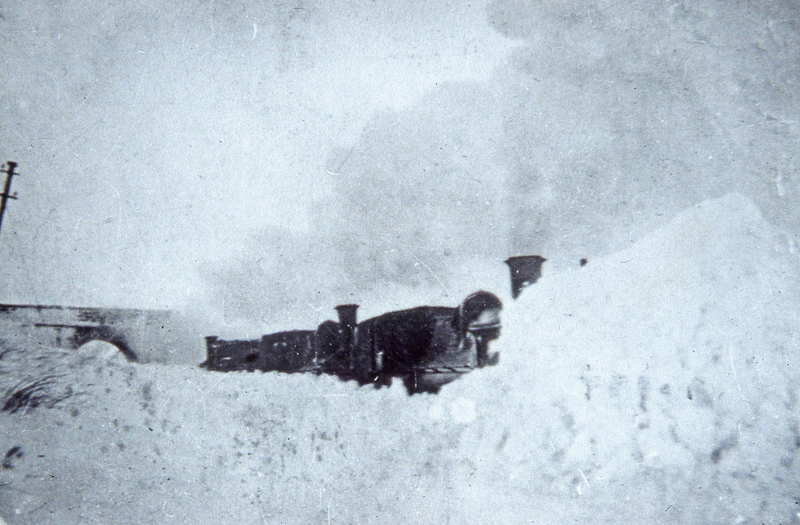 Rosedale Bank Top – severe winter drifting outside the engine shed (a William Hayes photograph courtesy of Malcolm Bisby). Towards the centre pillar is the coaling crane used for lifting coal out of standing wagons into locomotive tenders). Hayes R.H. and Rutter J.G., 1974. 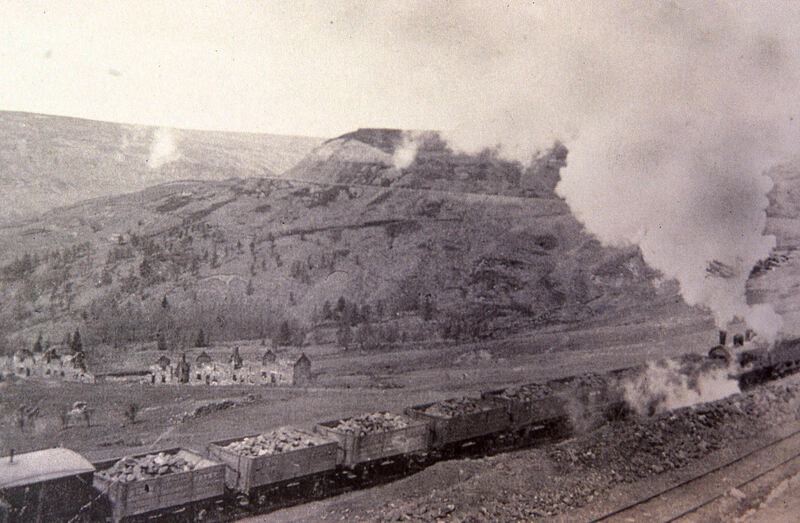 Rosedale Mines and Railway, Scarborough: Scarborough Arcaheological and Historical Society. Lane P., 1989. The Archaeology of the Ironstone Industry of Rosedale, North Yorkshire, Helston: P Lane. NE Yorkshire Geology Trust, 2010. When the devil came to Rosedale. Whitby: NE Yorkshire Geology Trust. Staley N.R. and King L., 1980. The Rosedale Railway: An Archaeological Survey, Helmsley: NYMNPA. I’ve spent the past 12 weeks clambering over the North York Moors with my camera, capturing the elements that form the Land of Iron Landscape Partnership Scheme. This adventure has been challenging, hilarious and hot (given the summer we’ve had). I began with the Combs Wood excavation, bugging the volunteers each morning by crouching on the ground to get the best shot as they dodged their wheelbarrows around me. It was incredible to see them constantly uncovering something new and seeing just how much had been hidden by the nature that surrounded us. See Combs Wood Part 1 – Volunteering, Combs Wood Part 2, and Combs Wood Part 3. This summer has been an incredible opportunity to learn and create. The people surrounding and supporting the Land of Iron scheme should receive a medal for all the work they do; constantly typing away on their keyboards in the office or covered in mud down a one-meter deep hole. It’s been a pleasure to dig in the mud with them for such a short time, and I hope I spend all my future summers in a similar way. Something else … The Land of Iron Landscape Partnership Scheme is approaching its halfway point with building conservation works starting on site and teams of volunteers across the North York Moors helping us care for our fascinating industrial heritage. We’re currently undertaking an EVALUATION SURVEY – this is a really important way to check the scheme is heading in the right direction and achieving what it wants to. Please give us a few minutes of your time to tell us what you think. Your feedback will help shape the next stage of the programme. In 1932 the Kingston upon Hull Corporation bought a large area of land in Upper Farndale in the North York Moor, c. 2,000 hectares. The Corporation had a plan to create a large reservoir behind a constructed earth embankment at Church Houses , and then using gravitation through a series of pipes/aqueducts bring a safe and reliable water supply down to Hull (c. 50 miles away). The plans also involved a second stage with weirs constructed in the neighbouring dales of Rosedale and Bransdale (and possibly Westerdale?) – with the collected water piped through the dividing hills into the Farndale Reservoir, if and when demand required it. The River Dove which runs through Farndale naturally flows into the River Derwent which then flows into the River Ouse which ends up in the Humber Estuary where Hull is located – so all within the massive Humber river basin. From the regional newspapers of the time there is a suggestion that the City of York considered a similarly located reservoir during the first reservoir enthusiasm at the end of the 19th century. In the 1920s/30s there had been another such outbreak of enthusiasm to use large scale engineering to make the most of natural capital and ensure sufficient safe water supplies with all the resulting health and welfare benefits. Ideas of progress and modernism assumed that cities and industry would prosper and expand if allowed to. Reservoirs meant (rain) water could be collected, stored and released under control, rather than relying on unpredictable and capricious rivers. The Kingston upon Hull Corporation were willing to make the required large scale capital investment at this difficult time (the Great Depression) for a better future. As well as the very useful amount of water that could be impounded, the North York Moors water would be soft (less minerals) and could be mixed with the hard water from the Hull environs, thus improving the water as a product (the projected saving in soap is presented as one of the benefits from the scheme). Destructive flooding downstream would be prevented. The construction would provide a scheme of work for up to ‘600 labourers’ from the unemployed of Hull. Farndale, as well as Rosedale and Bransdale, were farming dales, surrounded on most sides by moorland, with low populations of people. The Leeds Mercury of Monday 29 August 1932 reports on what farmers in the Farndale area thought about the plan to build ‘the second largest reservoir in the country’. There was apparently some ‘alarm’ and concerns about possible effects on the water supply lower down the catchment, but the report also emphasises the employment opportunities (a common claim with all infrastructure projects, now and then) and potential increases in property/land values. As well as the large scale areas of farmland to be lost, a small number of individual farmsteads (c. 3 or 4?) would be submerged however there would be no “drowned villages” as there had been elsewhere in the country. 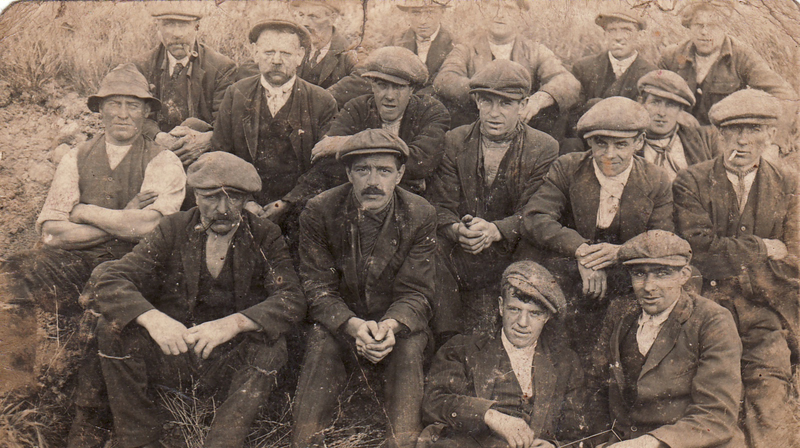 In the meantime the farmers in Upper Farndale remained the tenants of the Corporation. During the 1930s arguments continued to appear in the regional papers – in letters, articles and editorials – mainly focused on who would have to pay for the scheme, who would benefit from the scheme, whether the water collected in Farndale was actually ‘pure’ or ‘peaty’, and whether the substrata of Farndale was pervious or impervious and therefore suitable for holding water (the top end of Farndale where it is sandstone rather than limestone is impervious). The main controversy seems to have been whether the reservoir was actually needed or not – opinions were based on short or long term perspectives. It was claimed the work itself would take at least 10 years, but would result in a secure water supply for Hull for somewhere between ‘100 to 150 years’ up to ‘all time’. Whereas some saw it as another ‘grandiose and extravagant scheme’ the correspondent below is very keen, and seems the scheme very much as a win-win situation for all. It also references the drive at the time by many local councils trying to ensure that their own local citizens had access to national water resources. Towards the end of the 1930s the plans were well developed and permissions were in place, although the money still needed to be raised. So the work had not begun when WWII broke out. The war didn’t stop the newspaper correspondence on the Farndale Reservoir idea – one letter writer warned that open reservoirs like the one proposed for Farndale provided the opportunity for enemies to poison whole populations. After the war the Farndale Reservoir scheme remained, every time there was a summer drought there were calls to revive it. The end of the war meant more visions of progress, wellbeing and resurrected cities. The Kingston upon Hull Cooperation hadn’t given up. Back in 1933 the Corporation had received the required powers through Parliament to build the waterworks, to compulsory purchase land, to abstract water, to stop up access and to borrow the required monies to pay for it – and in the 1940s and following decades they continued to extend the time periods of these powers. The Yorkshire Post and Leeds Intelligencer reported in September 1954 on the formation of the Farndale Local Nature Reserve largely to stop the large scale pillaging of wild daffodils. ‘Hull support for Famdale protection. Plan for nature reserve From our Hull staff. It is an offence to uproot flowers at Farndale, the North Yorkshire beauty spot, and in order to make Illegal also the picking of daffodils, the National Park Planning Committee of the North Riding County Council (as already reported in The Yorkshire Post) wish to establish the area as a nature reserve. 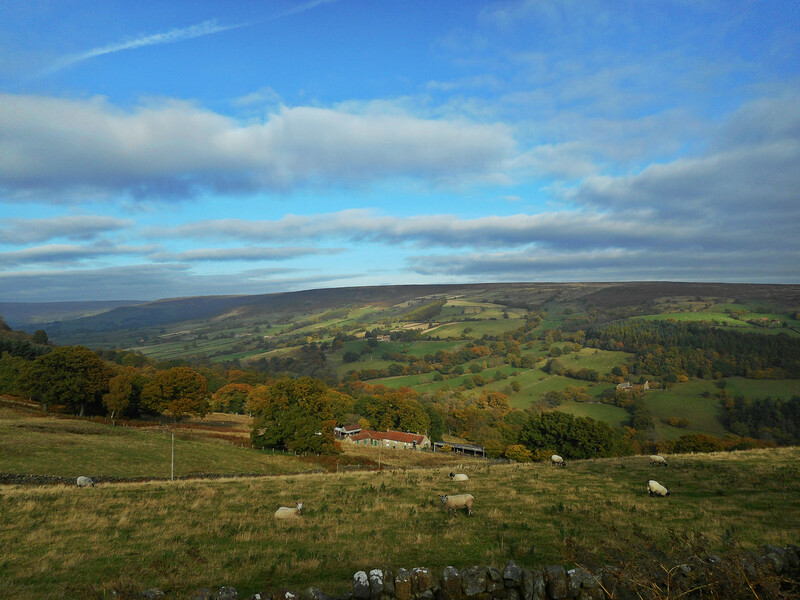 The Water Committee of Hull Corporation, who several years ago acquired a large part of Farndale for a future reservoir unanimously agreed yesterday, to recommend the City Council to approve the nature reserve plan. It was pointed out that when the Corporation needed the land for the reservoir, the agreement on the proposed nature reserve could be terminated six months’ notice’. Following on from the Water Resources Act 1963 the Yorkshire Ouse and Hull River Authority was formed. The Authority acting with the Kingston upon Hull Corporation and now also Sheffield Corporation promoted the new Yorkshire Derwent Bill, of which the Farndale Reservoir was one important element, aimed at regulating river flows and abstracting water supplies in Yorkshire. The Bill received a second reading in the Houses of Parliament in 1970. The projected price for the Farndale scheme was now up to c. £8 million should everything go to plan (£132 million in today’s money), the reservoir was bigger than previously planned but there was less pipeline/aqueducts as modern reservoir technology used more controlled discharge into rivers and more abstraction downstream. There would be compensation for the farming tenants who would move to new homes, and rearrangement of farm holdings dividing up the remaining farmland between tenants. 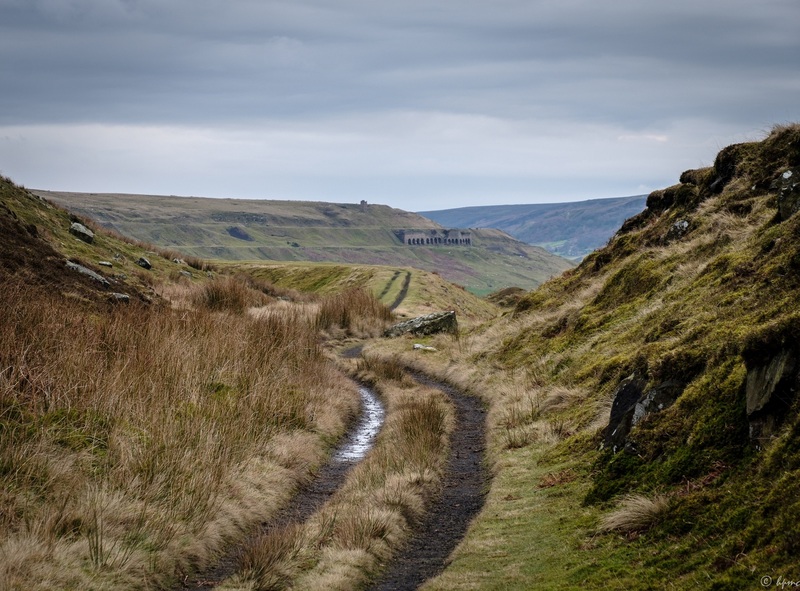 As well as the continuing arguments over who would pay and who would benefit, by this time there was the added complication that the North York Moors including Farndale had been designated a National Park in 1952. So there were new arguments around the introduction of an uncharacteristic large scale water body into a designated landscape. But as well as providing water supplies for growing cities, by this time reservoirs were also seen as providing recreational opportunities and water catchment protection, in line with National Park purposes. The reservoir plans included woodland planting and a car park. The remaining wild daffodils would line the banks of the new waterbody – ‘A host, of golden daffodils; Beside the lake, beneath the trees, Fluttering and dancing in the breeze’. (I wandered lonely as a cloud by William Wordsworth). In the arguments Farndale was presented as a national asset by all sides, but there was disagreement over what type of asset that should be. 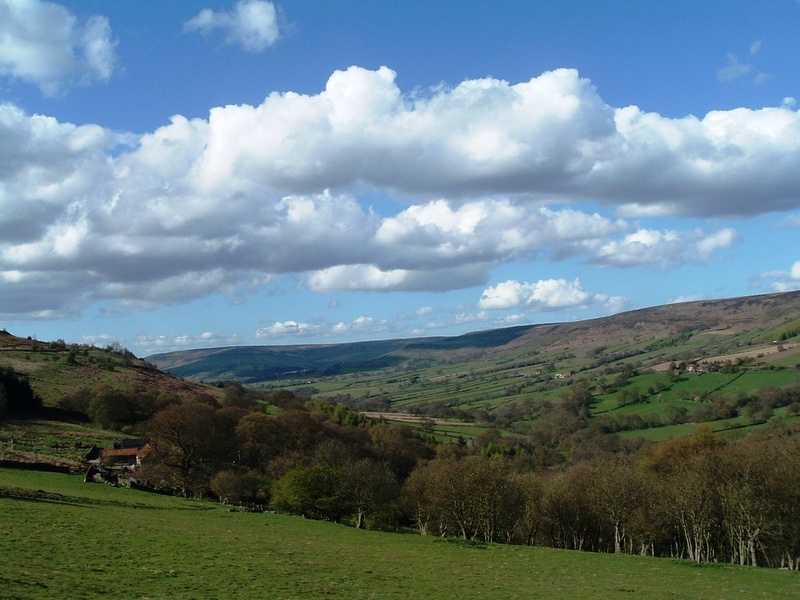 The North York Moors Planning Committee (the predecessor of the National Park Authority) did not object in principle. Around 10,000 people signed a petition against the construction of a new reservoir in a National Park. Already in the less than 20 years of its existence other major developments had already been allowed in the Park – the Cold War RAF Fylingdales installation and exploration for a potash development near Boulby. There were various suggestions of alternatives to fulfil the need for water supplies in Yorkshire. These included abstracting more ground water, reference was made to a so called ‘underground lake’ left over after the last Ice Age beneath the nearby Vale of Pickering; or making use of desalination processes which were currently being developed in the USA and were apparently due to come to fruition in the 1980s. As it happened, desalination turned out to be very expensive and not the overriding solution everyone was hoping for. So the bill was read in Parliament for a second time, the Ministry of Housing and Local Government as well as the Water Resources Board were both keen,… but then an All Party Select Committee tasked with vetting the bill before it became an Act threw it out on the vote of its Chair. So that was it. Hull and Sheffield do still have water supplies which suggests there were workable alternatives. Farndale remains a whole dale rather than half a reservoir. The second and final part of this anonymous but momentous poem, transcribed by the local historian Malcolm Bisby, describes the inherent industrial appeal of ironstone production in the North York Moors and the bustling economy that it brought. Picking up where Part 1 finished, two years have passed since the collapse and the kilns which have replaced the experimental kiln at Rosedale burn brightly in a never-ending production cycle. They roast (calcine) the ironstone, mined close by, which is then sent on its way to Teesside via the railway. The physical remains of the kilns today, at Bank Top and at Rosedale East, are tangible reminders of the way populations alter the landscape. Although the remains are quiet today, they once thronged with working people (including children) each with their job of work to do as this poem so clearly reminds the modern reader. The poem ends on an eerily prophetic note as the poet notes that, as long as the furnaces burn, there will be an industry present along with ‘peace and plenty’. The ironstone industry within the North York Moors burned fiercely but briefly, largely coming to the end of ironstone mining and calcining processing by 1929. After the poem we provide a unique insight into the industrial design of the experimental kilns, and those that replaced it, provided by Malcolm himself. T’would saved them much expense. Since first it did commence. To keep this kiln alright. And men of every size. Their wages are too small. Work very hard for their money. The works would soon stand still. Both iron steel and powder. Not much more than half paid. The mines to keep alright. They love a bit of talk. To straighten all foul joints. There soon is something up. To draw powder smoke away. We have some small trap lads. There’s one there night and day. And where they have to go. In keeping all things straight. They’ll never want a friend. Delight it was to me. She is a noble kiln. But they have won the day. She’s sure to pay her way. The workmen need not fear. There’s work for young and old. There’s still one half untold. In death’s cold chilling vale. This fascinating poem clearly gives some useful clues as to the construction date and design changes relating to the so called “New Kilns” (or ‘Iron Kilns’). The term ‘New’ used in this case could also mean ‘of different design’ – for these kilns appear to have been a unique, one-off experiment – doubtless hoping for a more efficient calcining process in terms of fuel cost, through put rate of more uniform heat distribution. However, this very crude system was doomed to be phased out by the gradual development of the Gjers design of calcining kiln (development of this design of kiln began around 1865) – compromising a large upright cylinder: constructed of wrought iron plating, internally lined with a refractory brick lining. This design of kiln was by far more efficient and easier to operate and was usually sited adjacent to the blast furnaces that they were supplying. The claimed coal to ‘raw’ ironstone ratio was one ton coal to 25 tonnes of raw ironstone. Malcolm will be presenting the final part of his lecture series (‘Tales over Tea‘) on the Rosedale Ironstone Industry at 2pm, Wednesday 18 July at Danby Village Hall. The ironstone industrial sites of the North York Moors and the Cleveland Hills were of great national economic importance in their time (Historic England Listing – Rosedale East Mines calcining kilns and iron mines) and utilised a considerable workforce for this most gruelling of industries in the 19th and early 20th centuries. The massive structures, the sense of progress, the nobility of endeavour, inspired emotional and artistic responses. A unique contemporary insight into the industrial expansion in Rosedale comes from this wonderfully evocative anonymously-written narrative poem about the New Kiln’s design trialled here – as transcribed by the noted local historian Malcolm Bisby. 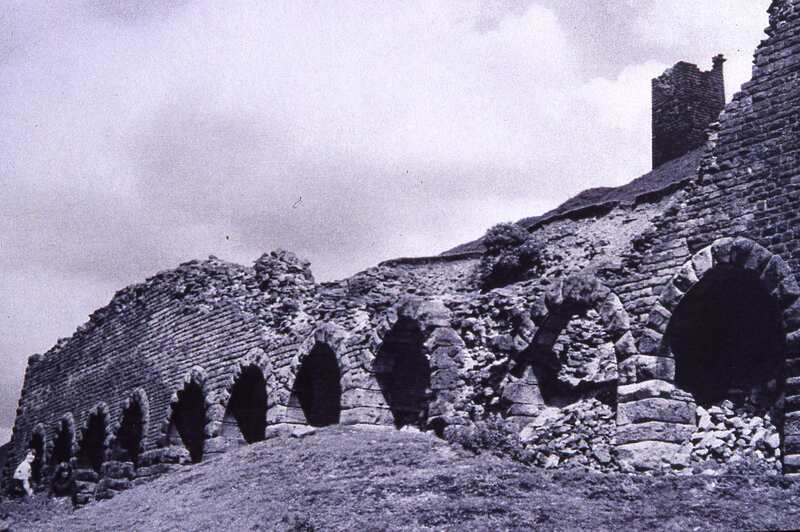 The kiln, built as an experiment in 1865 alongside the more traditional designs of the age, provided work for skilled individuals from across the region. Rosedale was productive in both mining quality ironstone and being able to calcine (or roast) it on site, before it was carried away by locomotives along the specially-constructed railways, which extended into the Durham and Tees areas from the heart of the North York Moors. As the poet recalls, the kilns roasted ‘by day as well as night’, a glow which lit the landscape in a way we can only imagine today in the peaceful and tranquil setting of Rosedale . . . Since last I talked with you. Although ‘tis a sad disgrace. What I have got to say. And they began to fear. He came from Lastingham town. It would be better perhaps for me. To let these men alone. It shortly all gave way. Had nothing but bad luck. About t’bad job, thou’ll see. And beggar all t’job lot. Part of this kiln gave way. They might have gone quite craz’d..
Before she was quite finished. They said they came from York. If only it had stood. The kiln is giving way. With some large iron rods. Tell Carter he’s to come. I think you’ll know the man. I’ll only say “Old Mick”. Or before you’re there she’s down”. How simple man must be! Which do not better know? I saw the other day. In country and in town. And not a better one can be. Three times the age of man . . .
We’re only half way through – the finale of this fascinating poem will follow shortly, with a unique commentary by Malcolm Bisby. Ring Ouzel (Turdus torquatus) are a member of the thrush family, and an annual migrant to the UK from Northern Africa. They look similar to Blackbirds (Turdus merula) but they are slightly smaller and have a striking white neck band which helps identify them (torquatus means wearing a collar). In the UK Ring Ouzels breed in upland areas of Scotland, northern Wales, and north and south west England; hence another name they have – Mountain Blackbird. They can also be seen as they come into and leave the country along the southern and eastern coast. Ring Ouzel are a UK Red List species because of their historical population decline – an an estimated 58% population decline from 1988-91 to 1999, and 43% range decline from 1968-72 to 2008-11. This means the birds are endangered in the UK, and are therefore of particular conservation importance. Action is required to try and maintain our population. 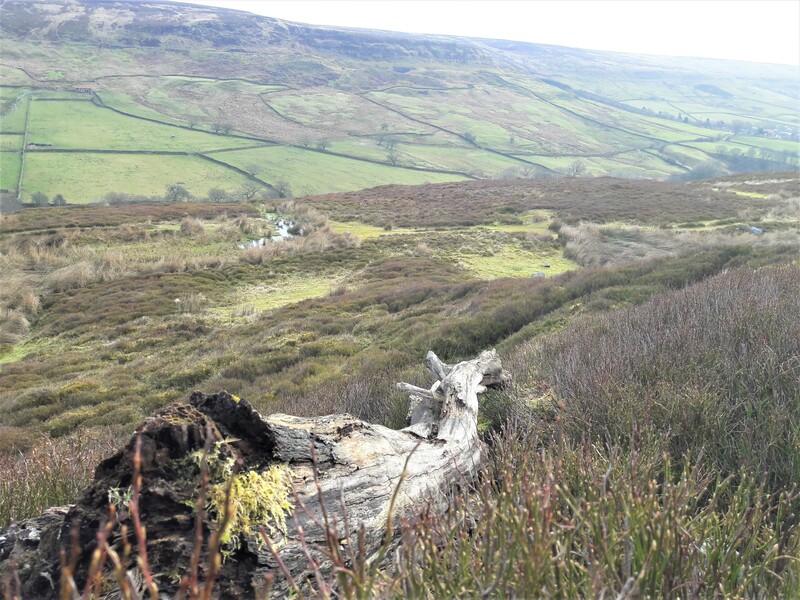 Within the North York Moors, local volunteers have identified Rosedale as an important spot for the birds. They’ve studied the population here in detail for the last 18 years. 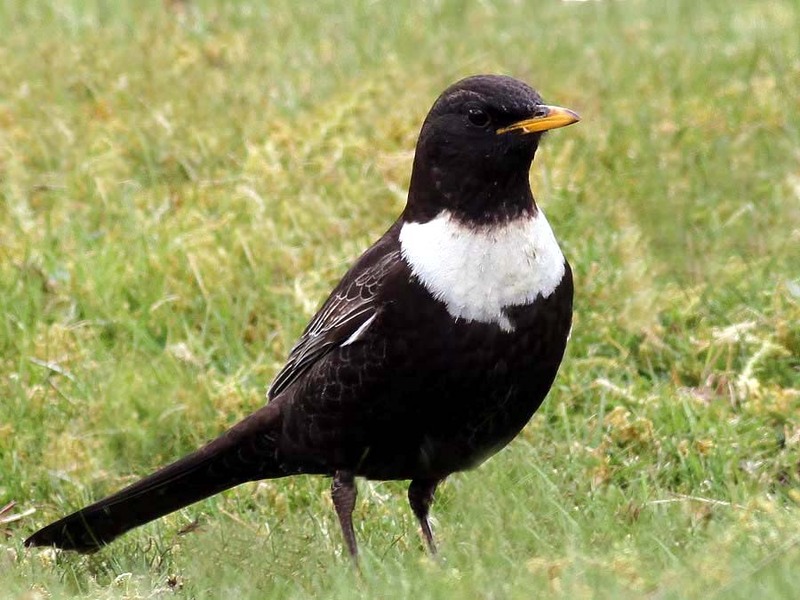 The Land of Iron Landscape Partnership Scheme has become involved with the aim of improving the local habitats, so helping to ensure Ring Ouzel persists in a landscape whose natural heritage has been shaped by its industrial heritage. It is suggested that the remains of industrial structures in Rosedale provide the crags and gullies that the birds prefer to nest in. A factor identified as a reason for national Ring Ouzel decline has been diet, which is mainly made up of invertebrates and berries. The red berries from the Rowan tree (Sorbus aucuparia) ripen from July into the autumn and are particularly important prior to migration in September when the birds need as much nutrition as possible for the long journey ahead. Within Rosedale, existing Rowan (also known as Mountain Ash) is located on the steep moorland edge – less accessible for sheep grazing, and not burnt as part of moorland management. However, many are now veterans, showing that there has been little natural regeneration recently. 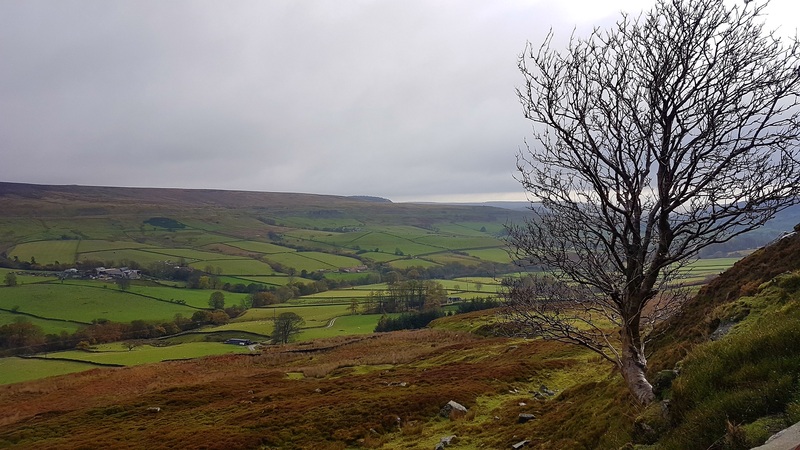 So with advice from the Rosedale Ring Ouzel volunteer monitors along with support and assistance from the landowner, gamekeepers and grazing tenants; the National Park’s Volunteers and Apprentices have been out planting. It took a while because they were working in some pretty wild weather at the beginning of the year but they eventually managed to plant 150 Rowan trees either in small exclosures or as single trees. 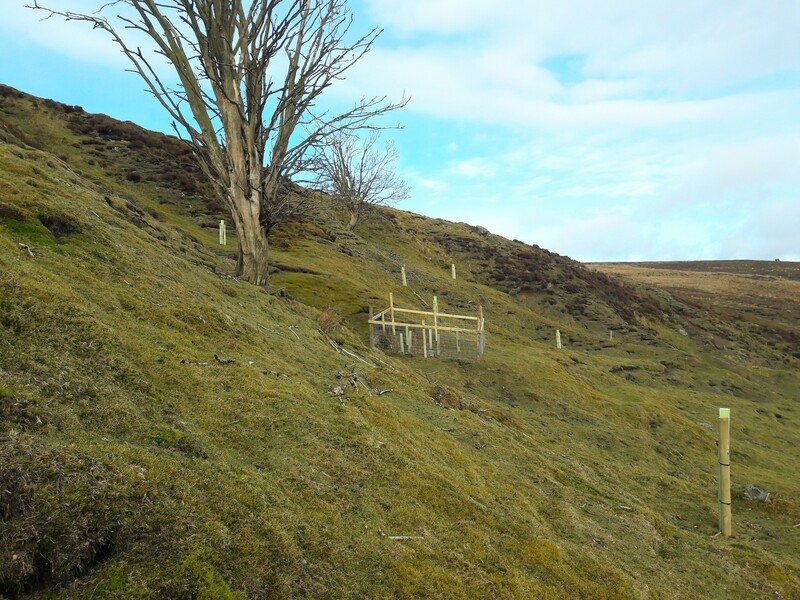 These new trees will help to provide the local Ring Ouzels with food into the future. The birds themselves have just arrived back in Rosedale to breed this year. I am a first-year undergraduate studying at Exeter University reading History. Public History is one of my core modules; it focuses on the presentation of historical knowledge into the public sphere and maintaining the efficient and ethical management of heritage. For this module I have to undertake a work place to learn the day to day business of managing a heritage site. The North York Moors National Park with heritage sites across the Park area seemed a natural fit for my placement and the Land of Iron team were kind enough to take me on. With my placement being only a short 40 hours, the team arranged a well packed and varied set of tasks around their National Lottery funded Landscape Partnership Scheme. The first day here I worked alongside Kim Devereux-West (Land of Iron Cultural Heritage Assistant) at the National Park Authority’s Castleton Depot. We were sorting artefacts from the community archaeology excavations carried out in 2016 and 2017, by material type. 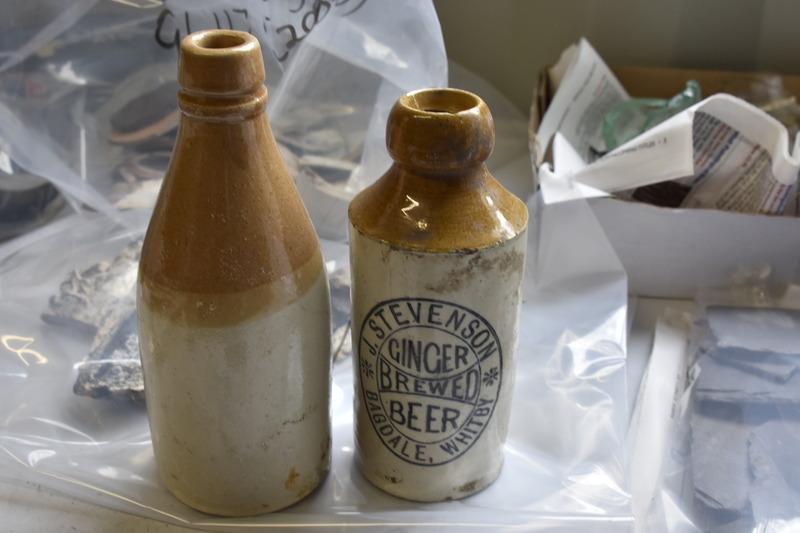 I came across a lot of interesting pieces, but if I had to choose one in particular I would have to mention the poison bottles, usually in good condition, but what struck me was how common they seemed to be. Later that day once the fog and rain had cleared we ventured up to visit the Rosedale East ironstone kilns and mines, and associated railway line. Having never been here before it was great to see such a unique and grand piece of heritage not only in its natural state, but also to see the work being done through Land of Iron to maintain the safety of the deteriorating site for the public. The remainder of the kiln structures still held a remarkable presence in the beautiful landscape of the dale, I couldn’t help thinking what a wonderful juxtaposition the views from the top of the pastoral moors must have been against the fully functioning industrial sites in their time. On the opposite side of the dale we visited the Bank Top calcining kilns. New interpretation boards in development will help provide a fresh and modern learning experience for the public, by telling the Land of Iron stories. 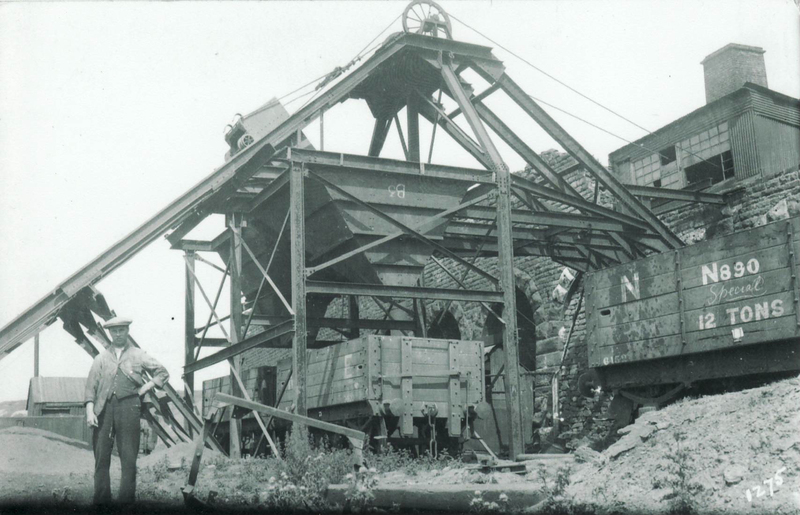 As there is little historical record for the miners, kiln workers, railway men and their families, it’s important to convey the site’s known history and what happened there, to ensure these incredible heritage sites are recognised and appreciated. Having had the luxury of visiting sites along the moors, I also had the opportunity to help out in the Helmsley Headquarters. It was great to learn about the hugely varying roles in the Land of Iron team all working together to progress their Scheme. 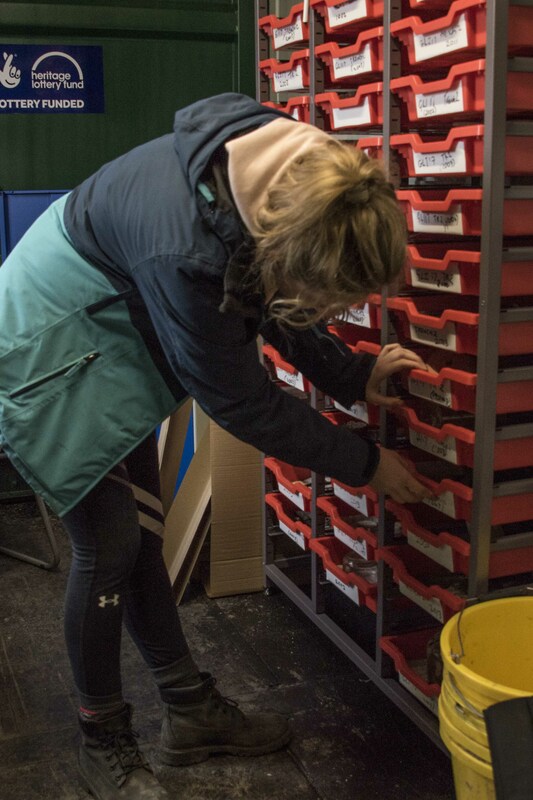 Having only ever been on the other side of National Park events and projects as a member of the public, it was extremely useful to gain an insight into the work behind the scenes. I got involved with another aspect of the National Park and heritage, I got to help set up and help manage an event for the public. Malcolm Bisby, a local historian and power bank of knowledge on the Rosedale ironstone industry, is holding a series of talks – ‘Tales over Tea: the story of the Rosedale ironstone industry told over a four-part series‘. Part two of four took place at Danby Village Hall. The venue had had to be changed because his first talk at The Moors National Park Centre was so popular the rest have had to be moved to a larger venue. The previous event space held up to sixty and we were aiming to set up for around eighty. Despite this last-minute change of location and a lot of reliance on word of mouth, the turn out did not disappoint as the Village Hall filled up. Malcolm gave a knowledgeable and engaging illustrated talk to the eager audience, who were also keen to get to speak to speak to him afterwards, showing how admired he is in the community. It was very useful for me to be able to see how much work it takes in setting up these kind of events and to meet so many enthusiastic people showing how worthwhile all the work is for community heritage. On my final and very sunny day in Helmsley, I was working again at the Headquarter this time in the IT department with Sandra Kennish. I spent the day scanning published paperwork and entering the information into a database. It is really important to record and organise as much available data and sources as possible, and make this accessible in the future. On Wednesday 18 April, ICOMOS celebrated the International Day for Monuments and Sites, whose establishment was approved by the 22nd UNESCO General Conference in 1983. The theme for this year was ‘Heritage for Generations’ and the events taking place were led by a group of chosen youth leadership who are emerging professionals in each of their countries. The events that took place were led by these groups using social media, and promoting the protection of cultural heritage with the hashtag #heritage4generations. If you use this hashtag when visiting a monument or event you can share why it may be important to you individually, as each human experience with heritage is different and unique. However, when each individual shares the story behind their monument or heritage, together with the global ICOMOS community, what starts as an individual experience of heritage becomes global, portraying the amazing variety of heritage and the effect it has collectively on culture across the globe. This social media movement is vastly important in encouraging the communication between generations and continuing conversations about heritage, so the cultural changes are documented from one generation to another creating an overall narrative for cultural heritage. I’d like to thank all the staff at Helmsley for firstly fitting me into their busy schedules and looking after me so well, and secondly for teaching me so much about heritage that is right on my doorstep which before this placement I knew little about. I hope this isn’t my last time being involved in the heritage sector and look forward to visiting the National Park again in the future. We’re keen on owl pellets on this Blog. 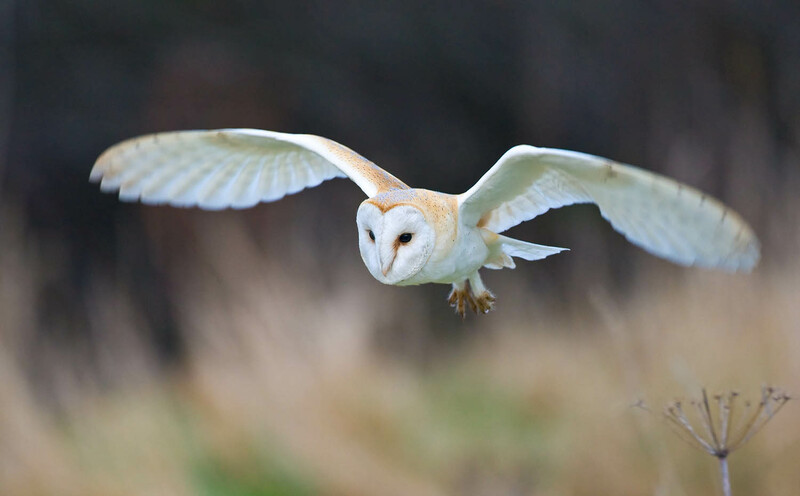 For more about owl pellets and what owls have been eating lately – have a look at this post by the Updale Natural History Recorder on the Our Rosedale Abbey Blog.